I have been trying my hand at some at 20th-century woodworking. 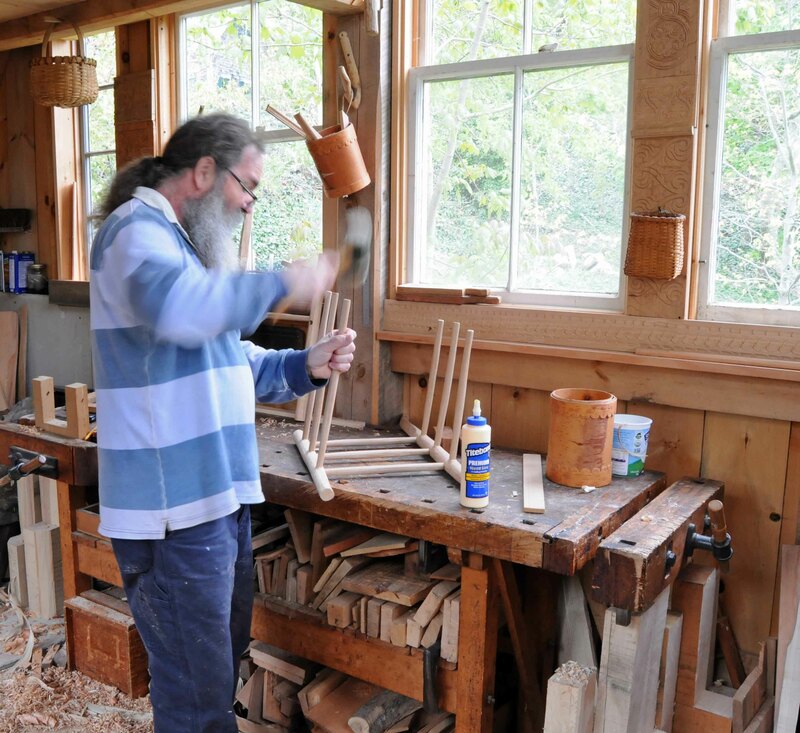 Going back to where I started, making a ladderback chair like the ones I learned from Jennie Alexander and Drew Langsner. I made them quite often back in the 1980s, but by 1992 I probably made my “last” one. The only ones I made since then were two small ones for the kids when they were little, December 2009. Here’s Daniel showing how much they have outgrown them. 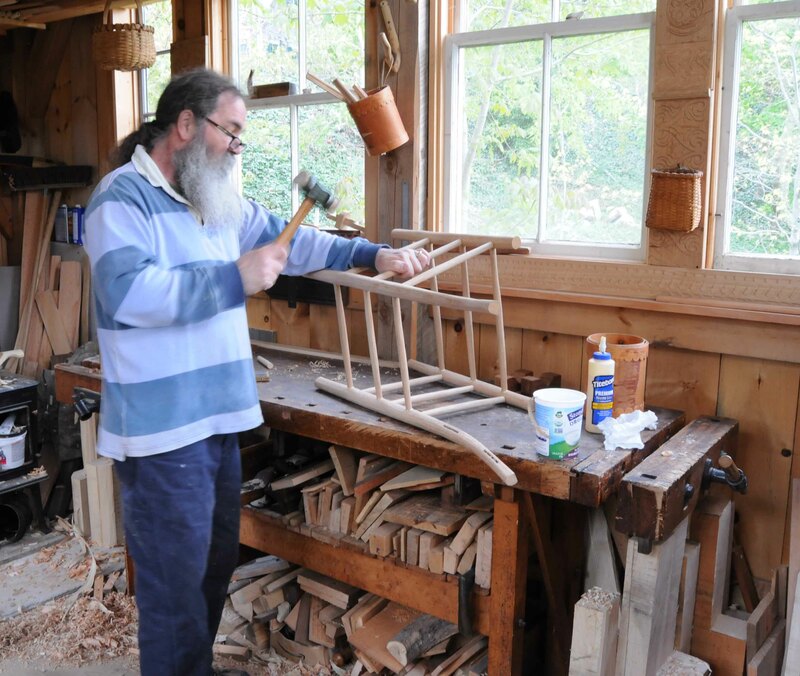 This is one of the late-period chairs Alexander made with our friend Nathaniel Krause. Slender, light, but strong. Very deceptive chair. But for years, I was swept up in the 17th century – and chairs, turned or shaved, were HEAVY. 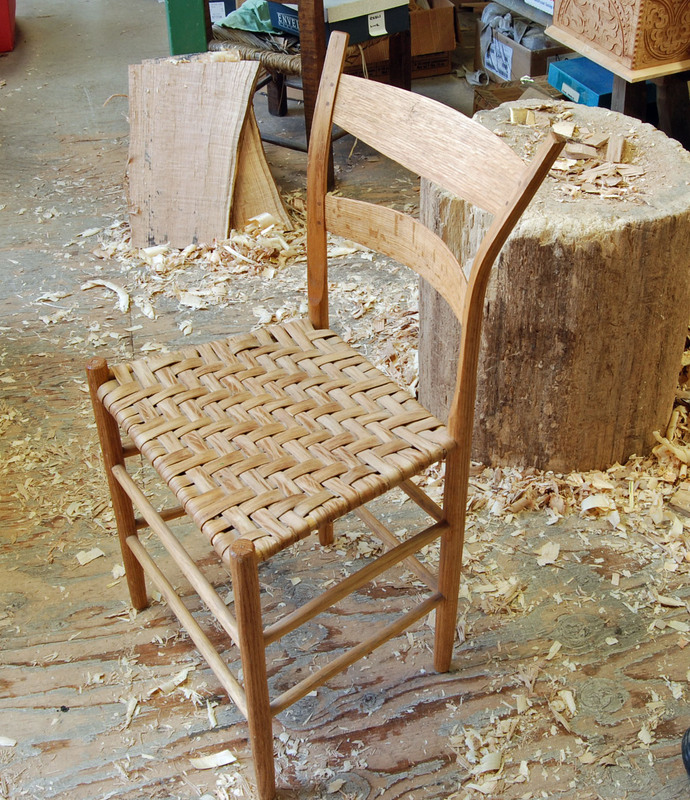 Here’s one of my favorites I made back then, maple, with oak slats. The posts for this are probably almost 2″ square. The rungs are 1″ in diameter (same as JA’s posts!) 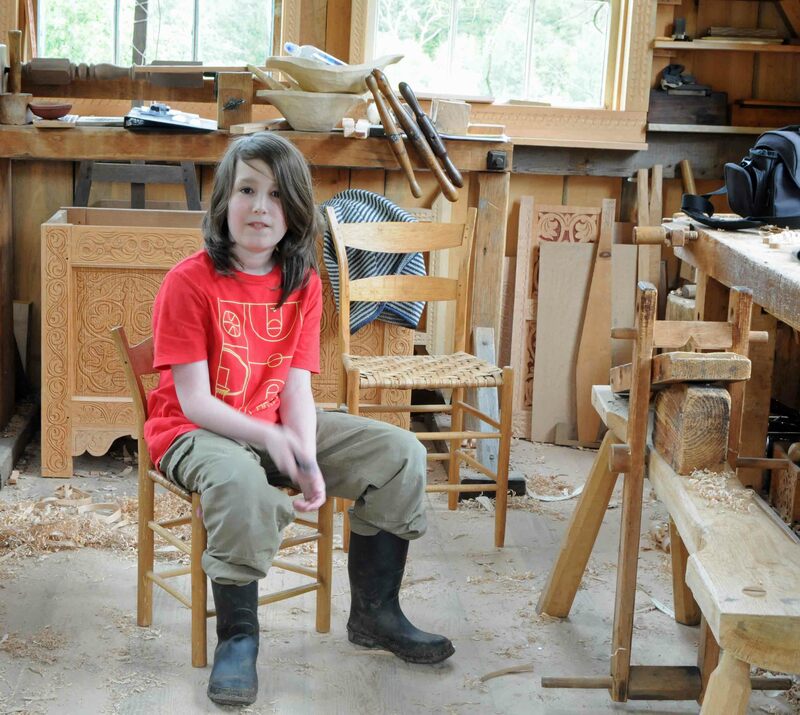 with mortises bored 3/4″ in diameter. Some of the turned ones are even heavier, and this is not the biggest. All ash. So today I shaved the rungs down to size, with 5/8″ tenons. The rungs are not much heavier than that – they don’t need to be. The rungs have been dried after rough-shaving, in the oven until the batch of them stopped losing weight. Then shaved down to size. I bored a test hole in some dry hardwood, then jam the tenon into that hole to burnish it. then spokeshave down to the burnished marks. 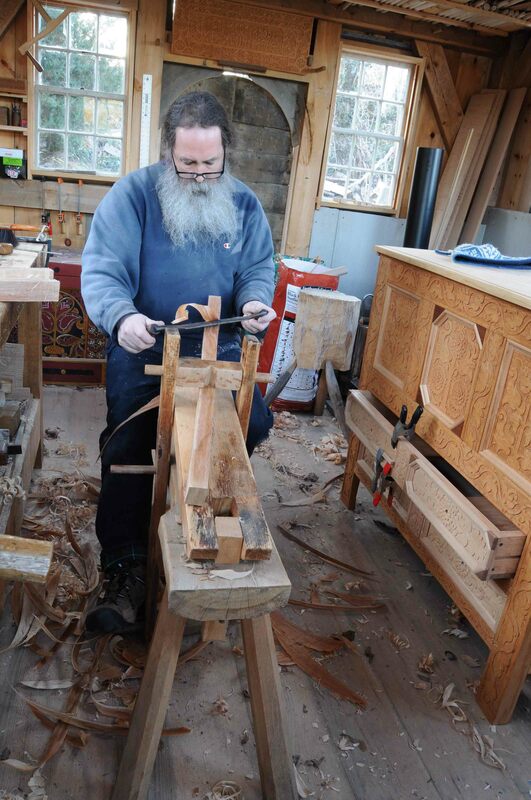 I skew the spokeshave a lot, to keep from rounding over the end of the tenon. it’s a Power Bore bit. 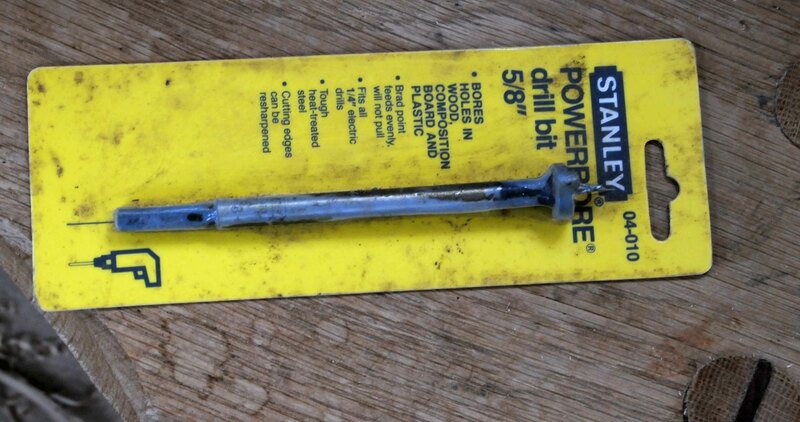 Was made by Stanley, I guess out of production now. I have an extra if something happens to this one. Then knock the side sections together, check the angles, and bore for the front & rear rungs. Still needs to go a little to our right..that’s a level in my hand, checking to get the side frame oriented so the boring is level. Then more of the same. Then I knocked it together. Yes, I used glue. Probably not necessary, the oven-dry rungs will swell inside the somewhat-moist posts. but the glue doesn’t hurt anything. 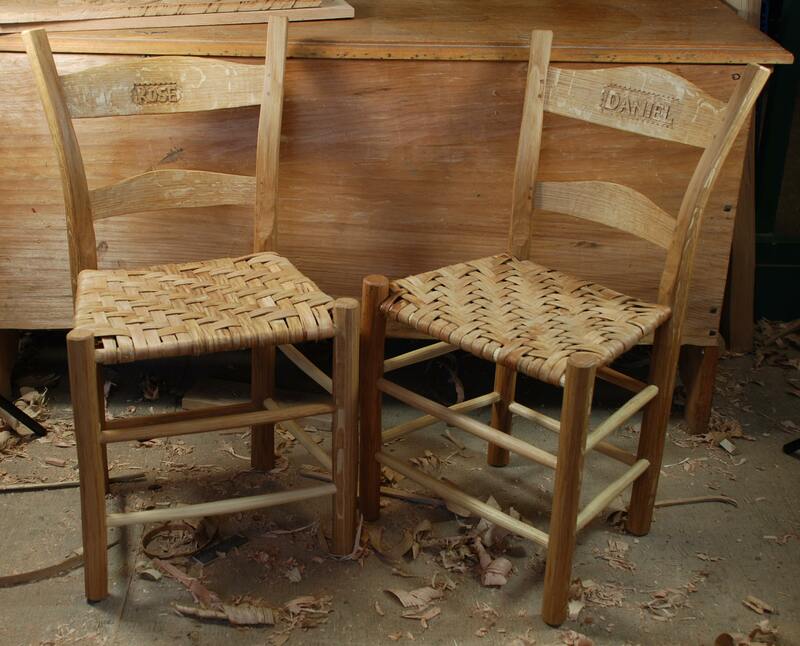 I never glued the larger chairs pictured above. I got the frame done. Next time I work on it, I’ll make the slats from riven white oak. I’ll steam them & pop them in place. 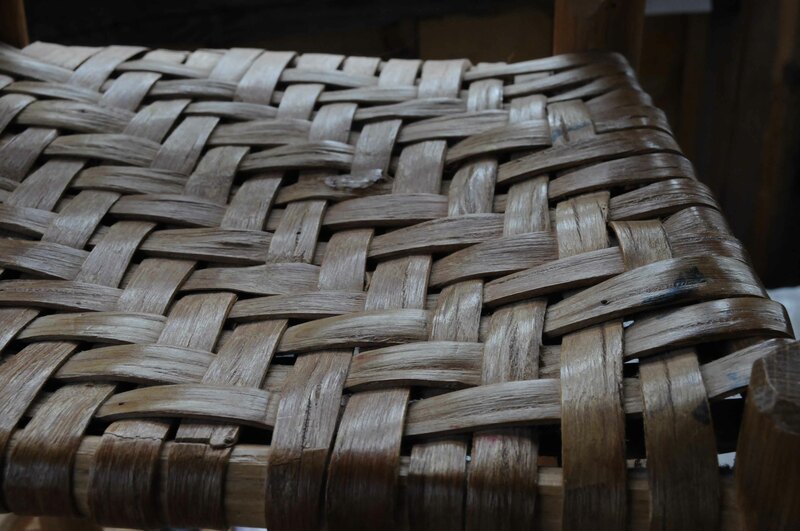 then weave a seat. Either hickory bark or rush. Bark is best. 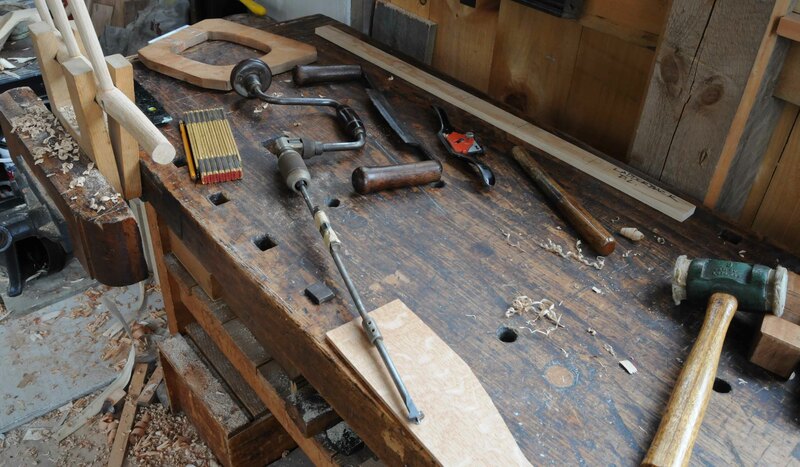 Small tool kit – those pictured here, plus riving tools, a mortise chisel. Saws for trimming things to length. Not much else. Oh, a pencil. Yikes. …followed by hollows & rounds…. 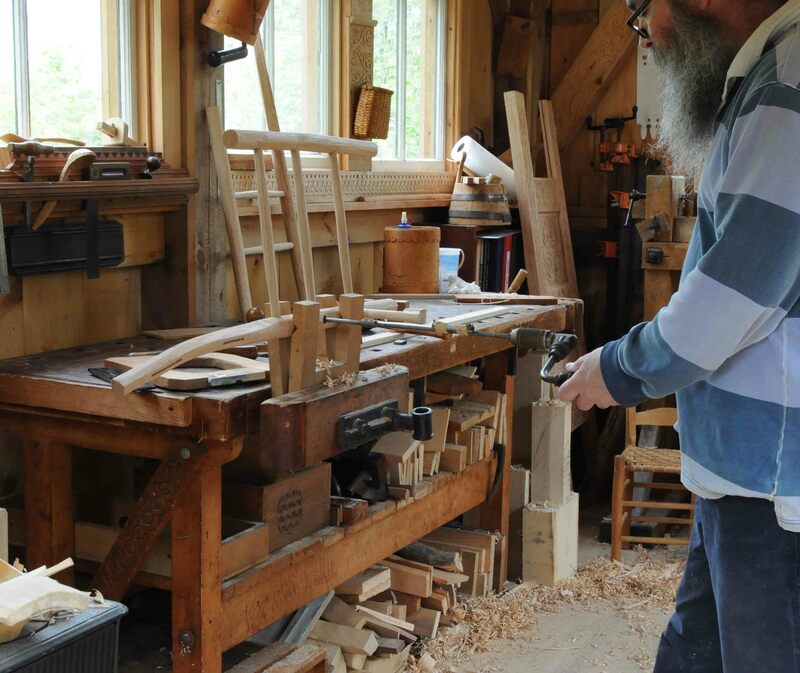 Here’s the inspiration – one of the last chairs from Jennie Alexander’s hand…and Drew’s book The Chairmaker’s Workshop. I had to look up a few things to remind me of what I was doing. 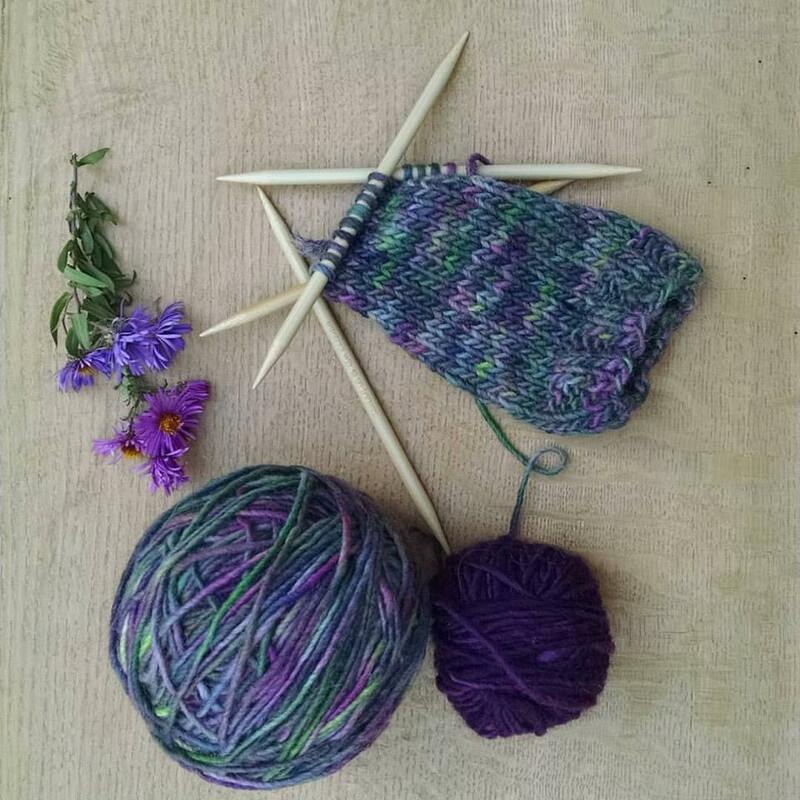 I thought I could review some stuff that’s been over on the blog before, there’s always new readers, and it never hurts to see details – even ones you’ve seen before. The following objects are from a group that I studied many years ago with Jennie Alexander and Bob Trent. 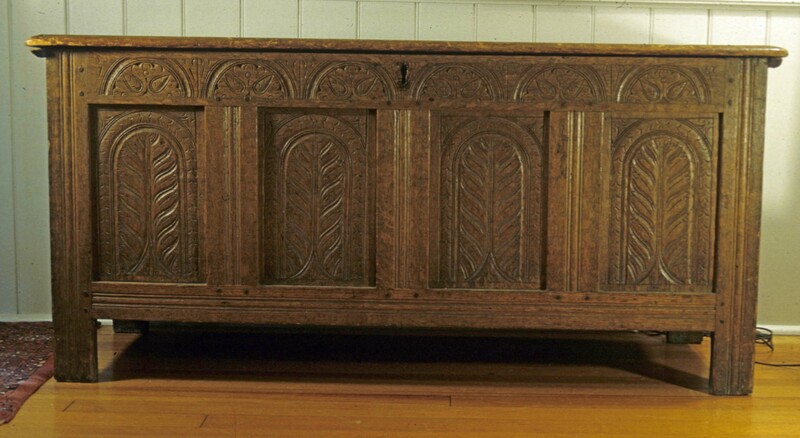 These were the first oak chests I ever learned about…so I always enjoy looking at them again. When I think back on the leg-work to find this – staggering. I also searched for who might have been the original owners in the late 1600s. From our research, we knew the group of chests came from Braintree, Massachusetts, so I had to do some genealogical research stretching back from the 1880s to the 1680s – eventually found some likely candidates, it’s in the article somewhere. Here’s the same chest, scanned from one of my color slides. 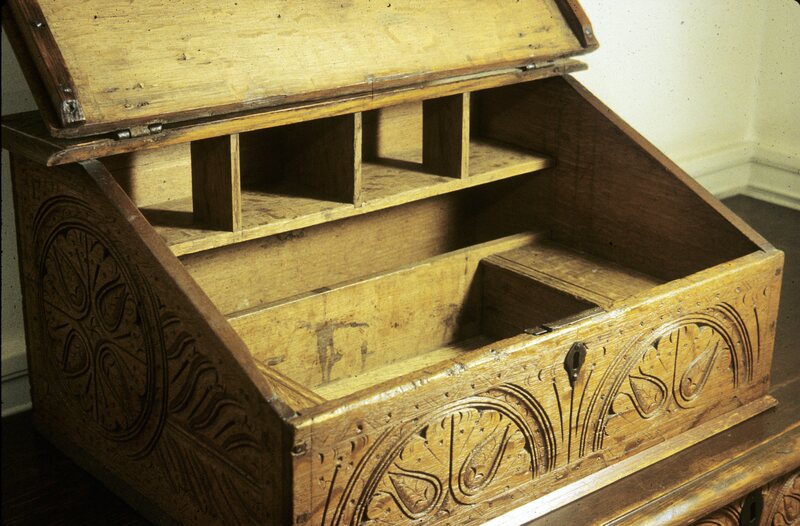 Until this one, all but one of the joined chests we had seen had one (sometimes two) drawers underneath. I’ve built copies of this chest many times…. 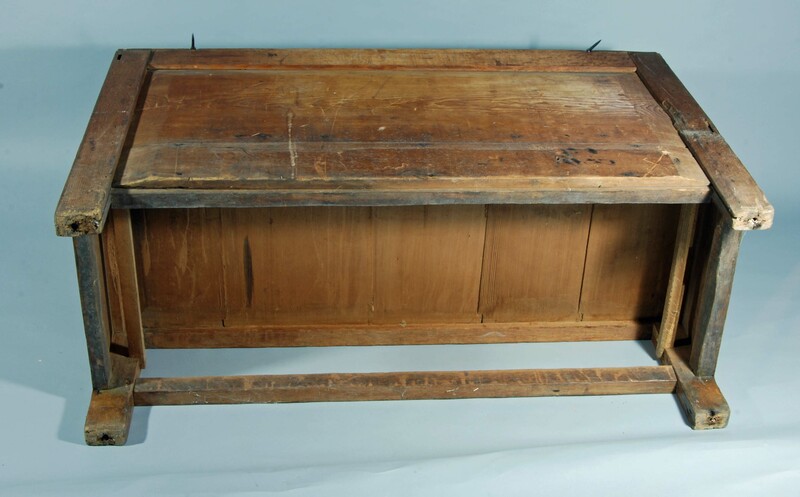 Here’s the other w/o drawer-chest, with brackets under the bottom rail. Lost some height of its feet, and has a horrible replaced lid. 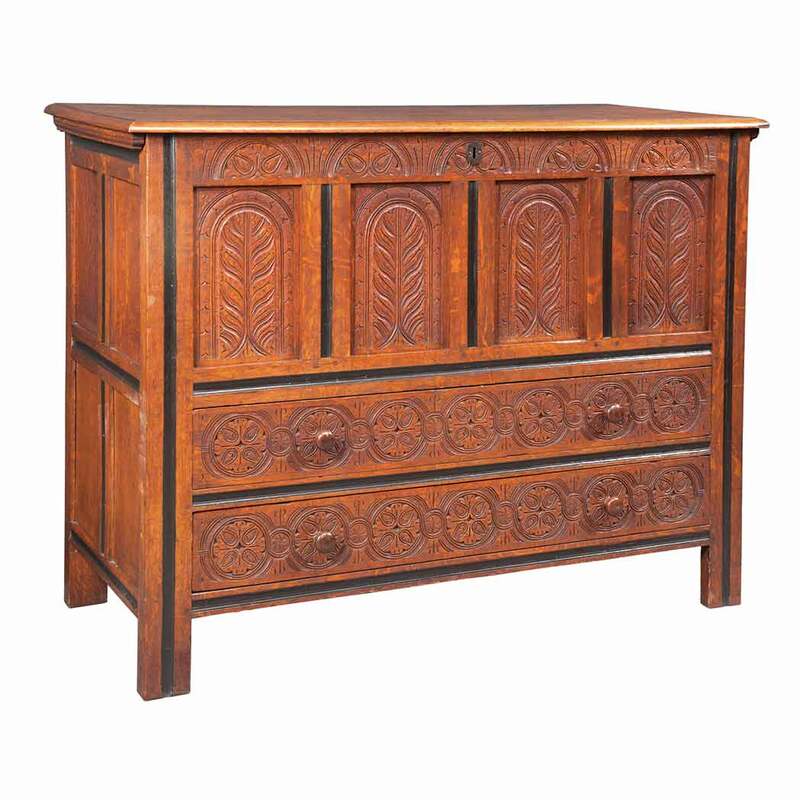 One distinctive feature of these chests is the way the floor fits into the chest. Instead of a higher rear rail that the floor is nailed up to, these guys use a lower rear rail, and sit the floor on it. And nail it. Here’s one I restored, with some white pine floor boards, sliding over the lower rear rail, and fitting into grooves in the side and front rails. The back panel is not yet installed, making it easy to see what’s going on. Tongue & groove joints between the floor boards. 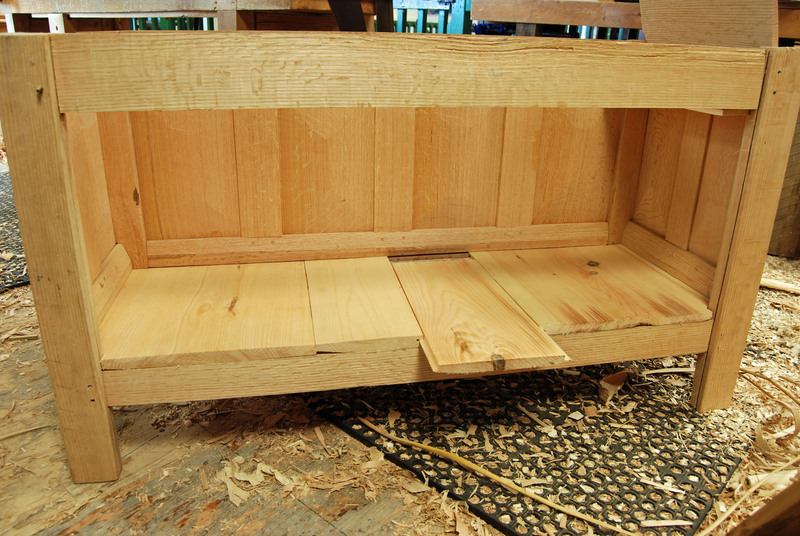 Then the back panel slides up from the feet, fitting into grooves in the stiles & upper rear rail. Here’s an overall view of one lying on its face. 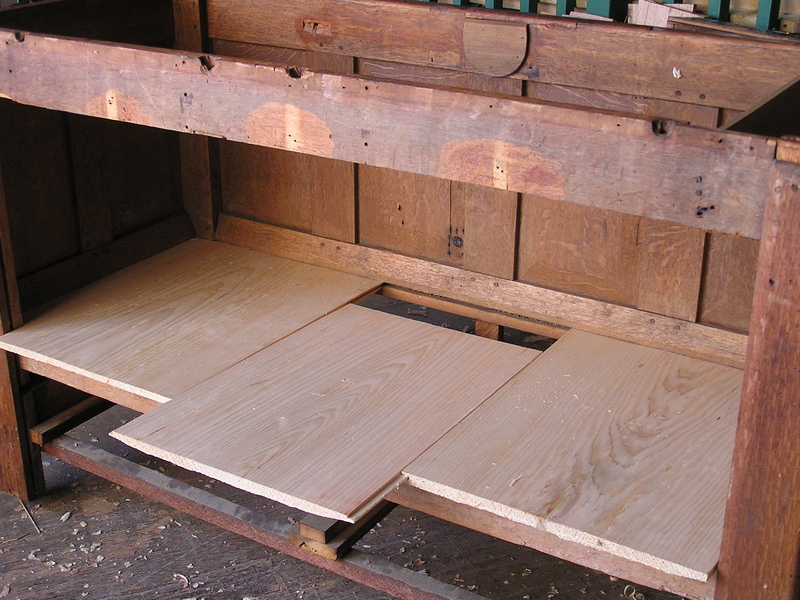 A white pine panel, (glued-up to get enough width to fill behind the drawer) – bevelled on its ends and top edge to fit the grooves. Slides behind the lower rear rail(s) – and is nailed to the bottom-most rear rail. Here’s a detail. 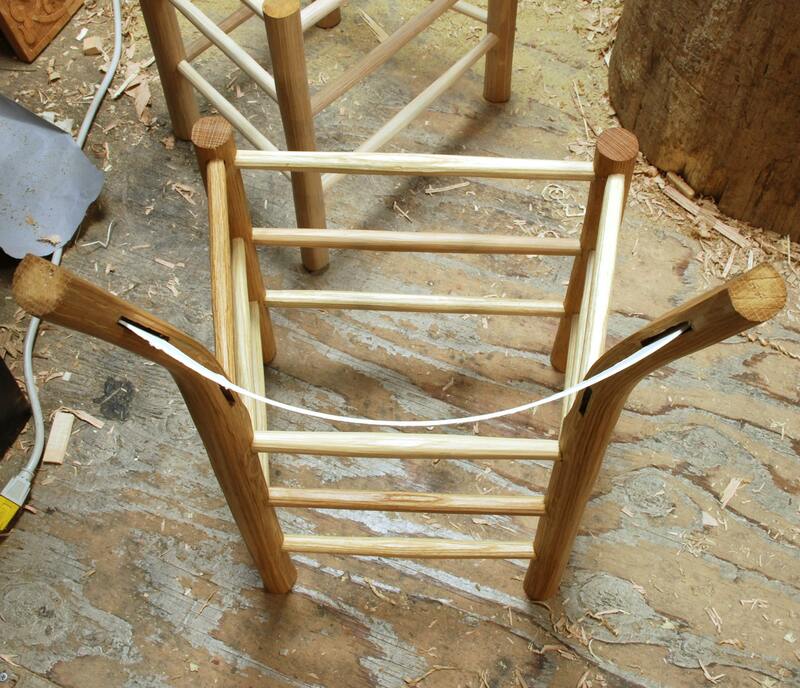 It requires some careful layout of the joinery for that/those rear rail(s). 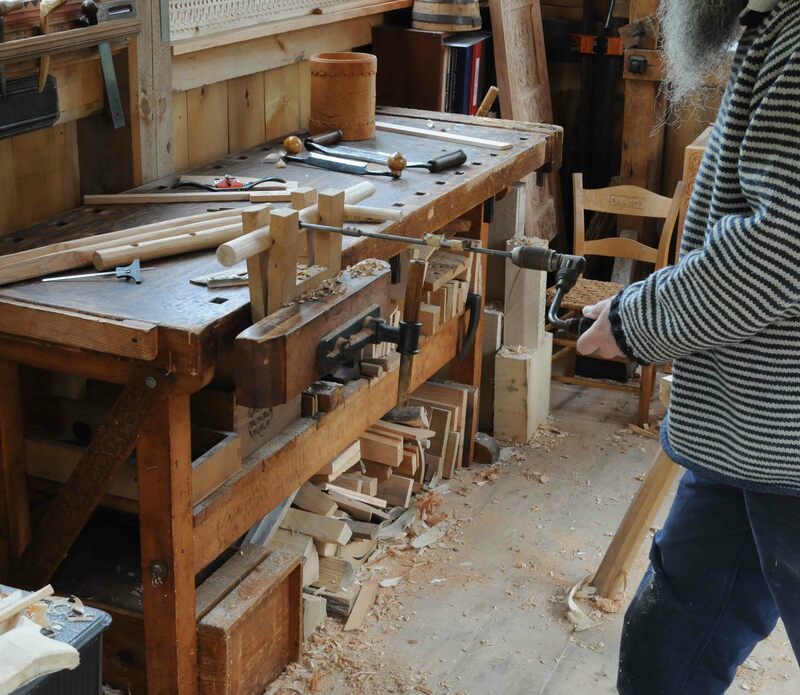 The tenon is “barefaced” – it has only one shoulder. Fun stuff. 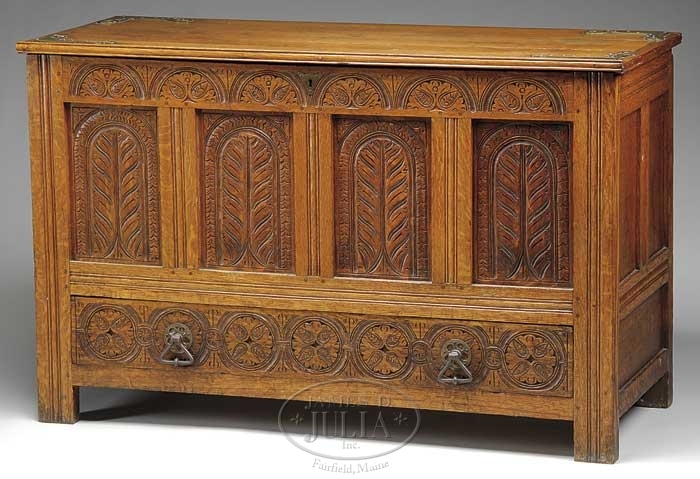 Since the 1996 article there have been maybe 6 more of these chests that have shown up in auction houses. etc…I never saw this one, from James Julia Auctions in Maine. Clearly weird drawer pulls, something funny about the lid, but otherwise looks great. 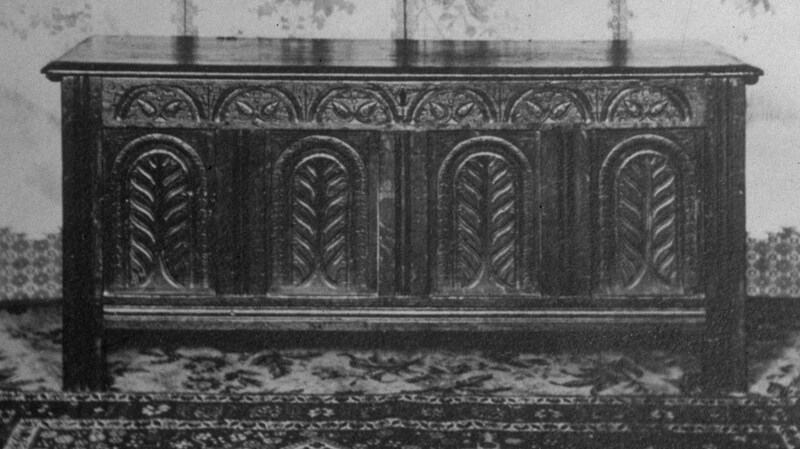 I’ve written about these chests and boxes many times…here’s a search for “Savell” (the name of the joiners who we think made them) https://pfollansbee.wordpress.com/?s=Savell – there’s other stuff mixed in there, but lots of stuff about the chests and the carvings. 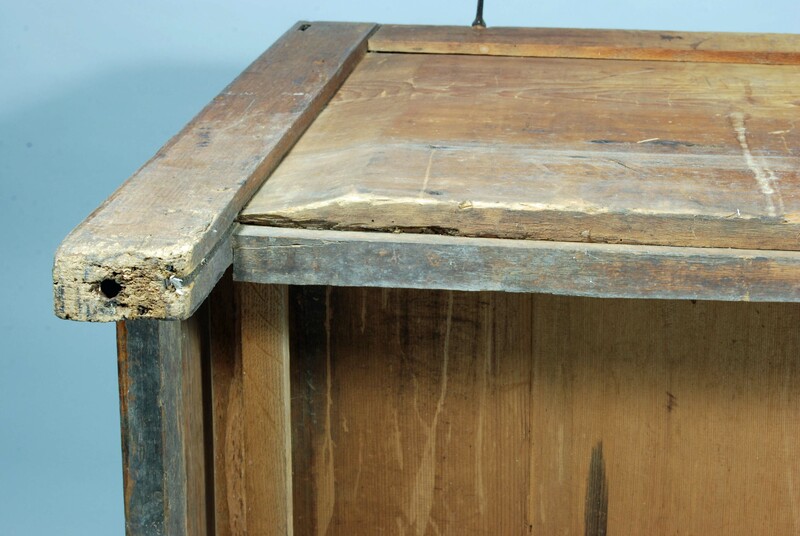 For that demo, I am mainly concentrating on furniture from Plymouth Colony, where this sort of “lipped” tenon was standard practice for joined chests and cupboards. In this configuration, the molding is integral, not applied. 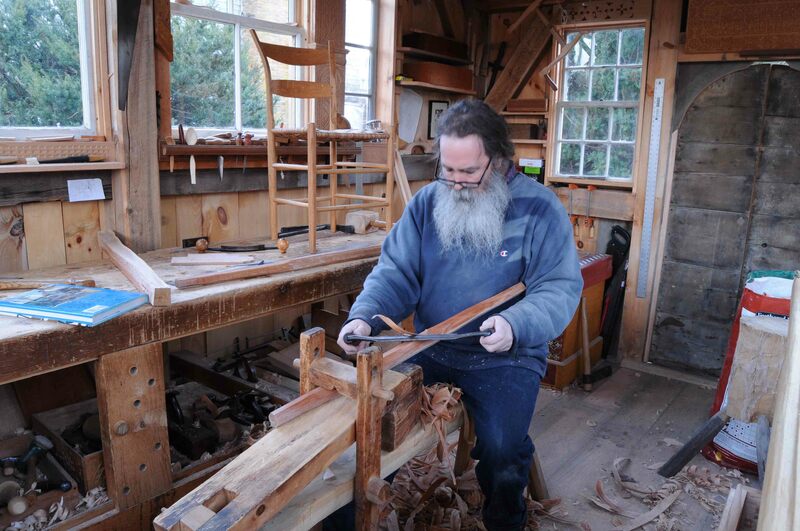 It makes for some complicated work cutting the tenons. The cheeks are sawn, and the joint is not draw-bored. 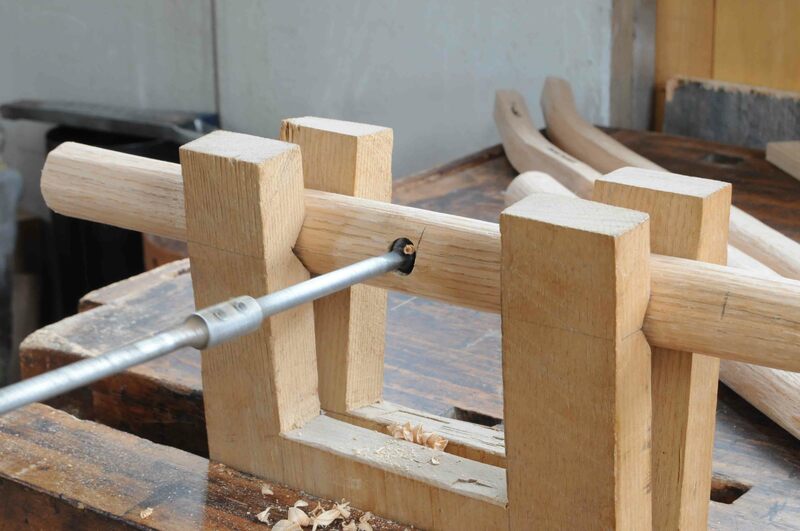 One or two square pins secure the tenon in place. I haven’t done one in almost 15 years, so I will make a new demo piece to replace this grubby-looking example. 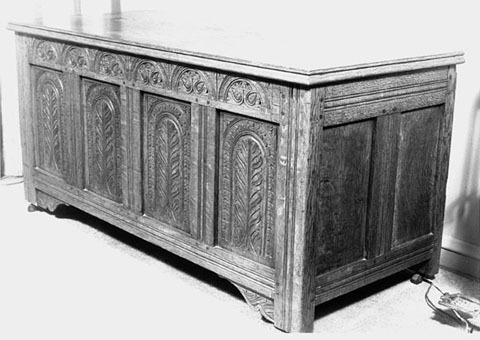 But what I have been really excited about is the new London carved pattern I wrote about last week. I knew I would try to squeeze it in, so I carved this sample of it the other day. It took some tinkering to figure out the layout and sequence of cuts. A test version is essential for me when I’m doing something this complex. I got it along pretty well, but knew this one is a sample at best. So I didn’t bother finishing it, but now have a good idea of how to tackle it for next time. The post about making the pins for drawbored mortise & tenon joints brought a couple of comments, and a couple of questions. First & foremost, the moisture content of the pins – bone dry…gotta be. I shave mine dry. I split excess straight-grained oak into pin blanks and then store it around the shop. They are small-cross-sections, so dry quickly…but in any event, I always have several piles of them around – from green to dry. They do have to fit the holes, but the taper in their length makes this easy enough to acheive. 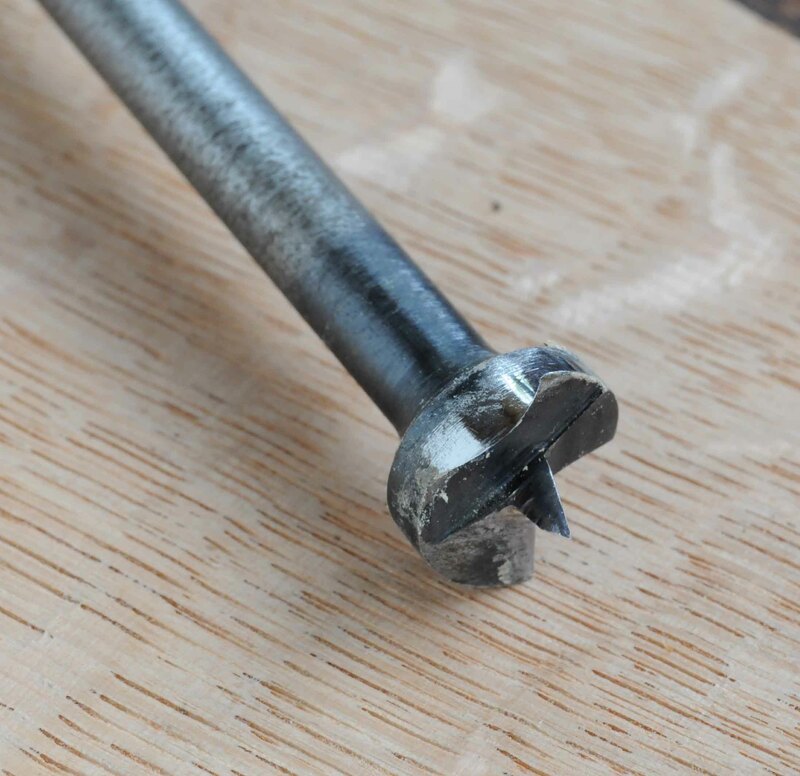 It doesn’t hurt to have a piece of scrap stock with a test-hole bored in it, and check your first dozen or so pins in that hole…typically beginners make the pins too stout. Hmm. I adopted this method of shaving pins when I saw it in a sixteenth-century woodcut. I find it really works, and splitting the stock is very easy in such short lengths. You can often split it down to nearly the size you need. I say make your pins that way, and you’ll get good at ’em. 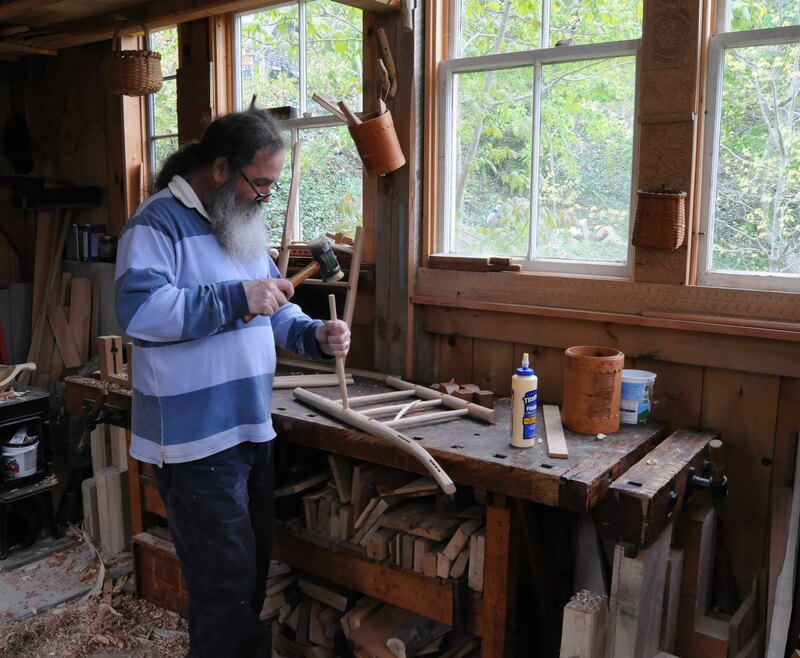 Shaving them from long stock with a drawknife will get you good at shaving them from long stock with a drawknife…either way, make them dry, make them tapered. I do use drawbore pins to pull the joint together first, this allows me to check the joints and make sure everthing is as it should be, before I put any wooden pins in. Some folks think these steel pins will wreck the drawbore, but I’ve never had a problem with them. Alexander found these pins at Sears many years ago, and handled them for me. Cheap & effective. 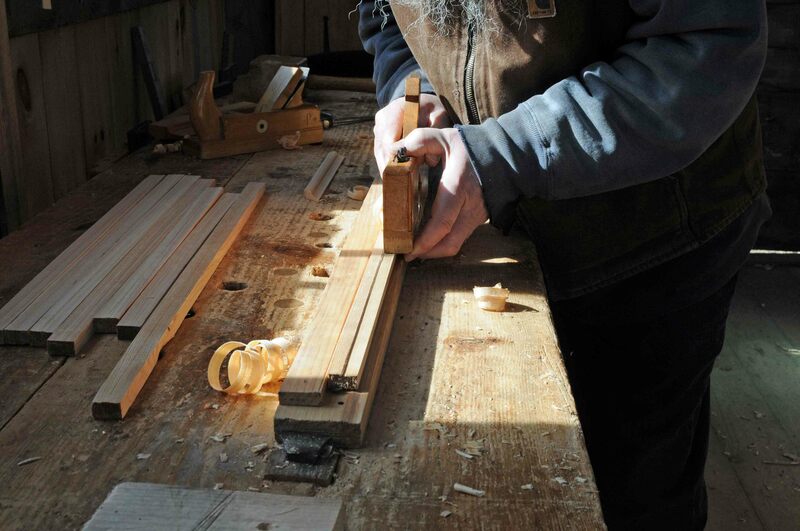 I also often use a numbering system for making certain that the correct tenon is in the mortise. Here just the mortise chisel chops Roman numerals to ID the joint. 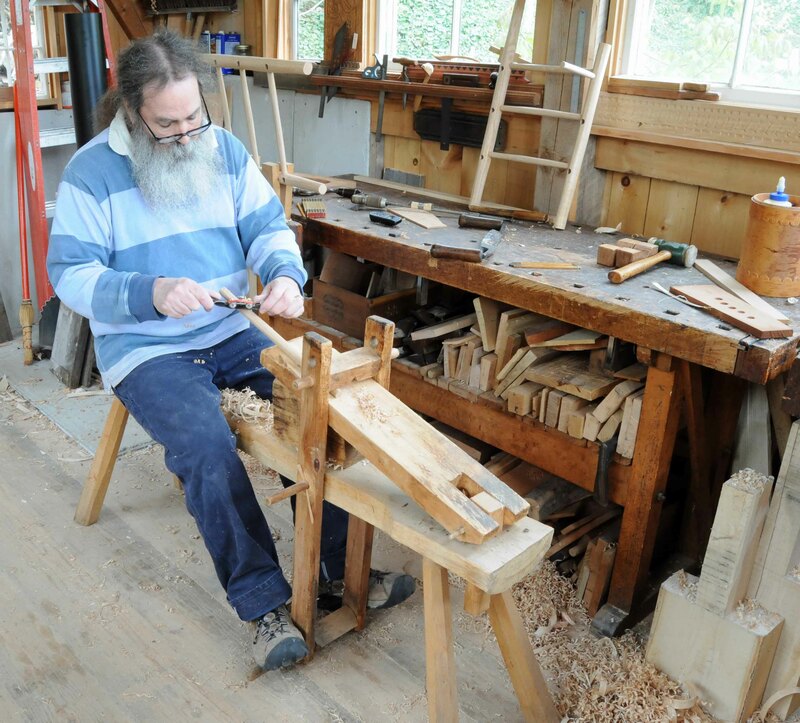 Here’s the inside of a recent stool showing the trimmed pins, the fore plane surface on the inside face of the rail; and the inner shoulder of the rail not quite hitting the stile. Also these pins are staggered in height, so as to not interfere with each other. 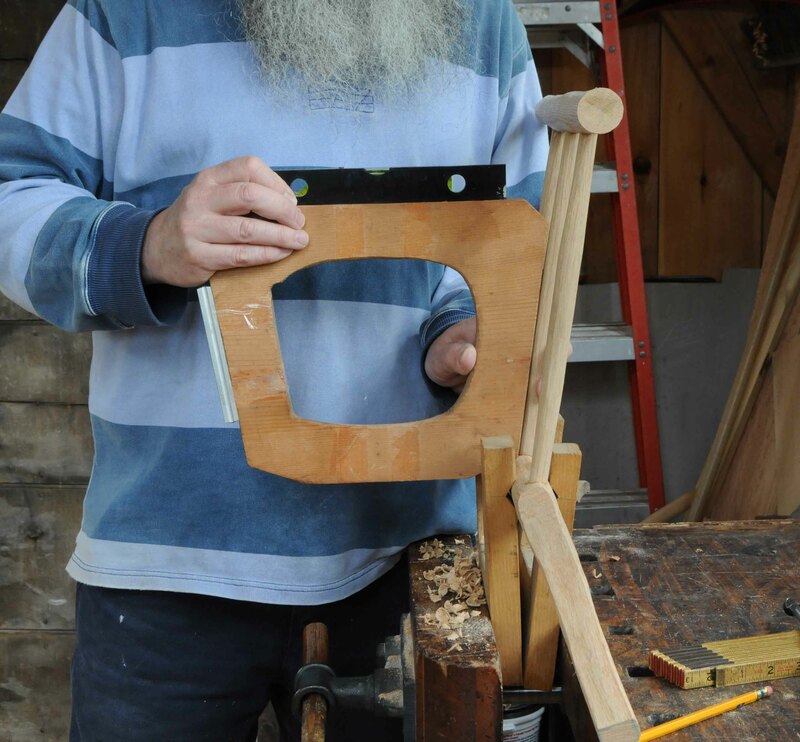 How it got this way is simple, I use it when I make the pins that secure the mortise & tenon joints in my furniture. First I split the stock from scraps of dead-straight dry oak. Any crook & they get discarded. It is critical that the stock be near-perfect because I want it to be strong enough to snake through the off-set holes in the joint. 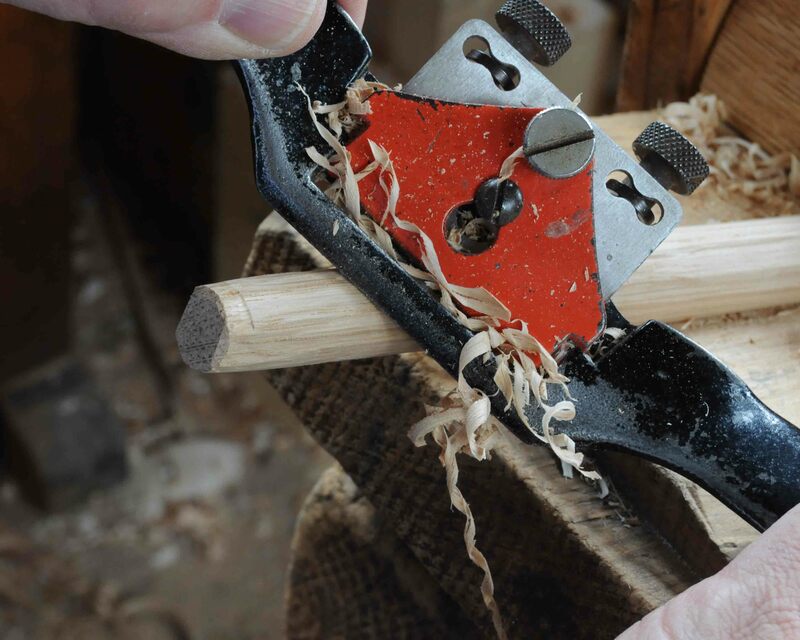 After splitting out a bunch of pieces, I shave them with the largest chisel I have – a 2” framing chisel. I find this to be the simplest tool for this job. The weight of it helps; when I have done this work with lighter weight chisels, I find I was pushing too hard…of course, it’s important to grab the pin stock up higher than the cutting edge. My pins start out about 5” long. Shave them square, and then taper them. Finally, shave them into an octagonal cross-section. 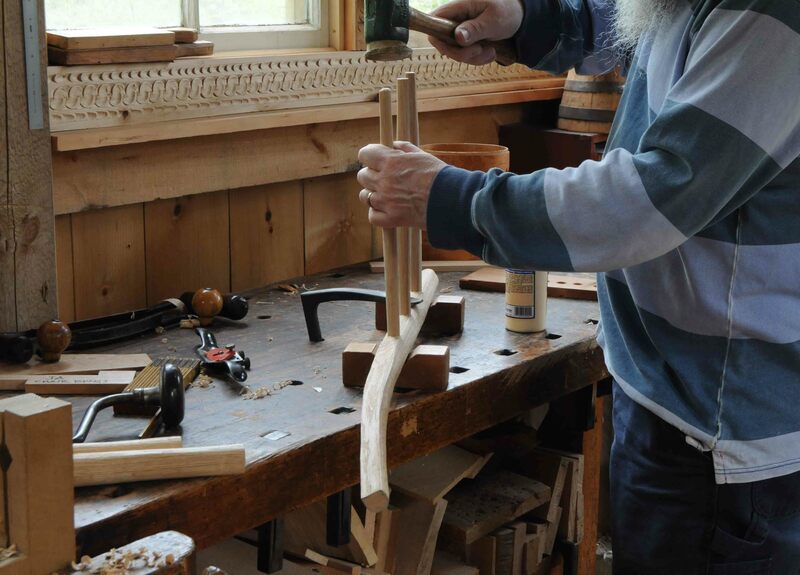 Sometimes, as in this period stool, the tips are pointed. Sometimes not, as in a wainscot chair I saw recently. In my previous post about miter squares the other day, I forgot Andres Felebien (1676). 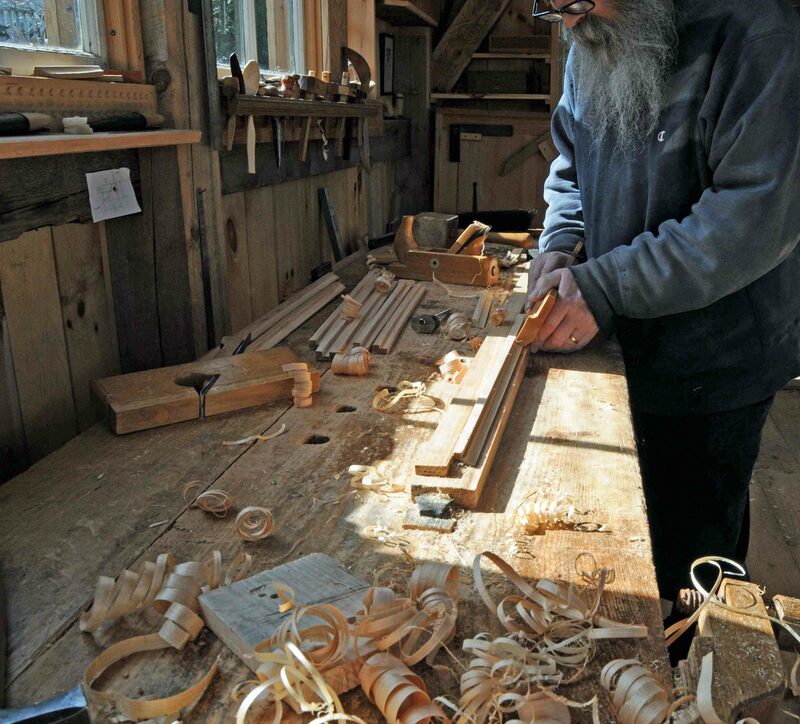 There is a lot of talk about Joseph Moxon on the web these days, with Chris Schwarz’ interpretive publication of Moxon’s chapter on joinery. Alexander & I have tried to remember to consult Randle Holme and Andres Felebien in addition to Moxon. I’d say Holme is our favorite; his drawings are quite enticing. Searching all three of these 17th-century authors can sometimes make things more clear; at other times, more confounding. The miter square is quite the same as Moxon’s; which leaves only Randle Holme who illustrated the multi-angle miter square. The modern one I have in my shop is set up to mark angles of 90, 30, 60 & 45 degrees.